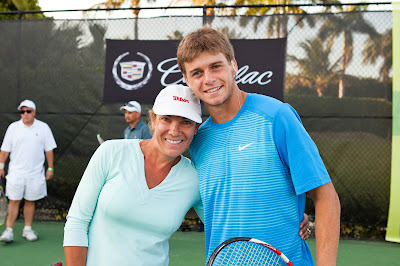 The 2013 Sony Ericsson men’s and women’s winners return to The Cliff Drysdale Tennis Center at The Ritz-Carlton Key Biscayne for my favorite charity event featuring the world’s top tennis players. On March 19th, 24 locals will have the opportunity to test their skills in a Round Robin qualifying tournament in which the winners earn a chance to play against and alongside the top pros. Led by Grand Slam legend and Hall of Fame nominee Cliff Drysdale, along with Tennis Director Mark Chellas and ESPN tennis analyst Darren Cahill, who all share court time and commentary throughout the event and Round Robin. This year's all-star lineup features: Novak Djokovic, won six Grand Slam titles and ranked number 1 in the world; Andy Murray, currently number 3 tennis player, 2012 Men’s Single Olympic Gold Medalist and US Open Champion; Anna Ivanovich, former number 1 singles player in the world and winner of the French Open; and Ryan Harrison (pictured below on the right along with Sharon Runk) the 18-year old who is considered by many to be the next great American men's tennis player. Interested in attending? The event will take place from 2 p.m. to 6 p.m. Guests will enjoy a Champagne reception with passed hors d’oeuvres, exhibition matches with the top stars from 5 p.m. to 6 p.m., a pro Round Robin, a “King of the Court” challenge match pitting the pros against the amateur Round Robin winners and much more. The action is open to the public by reservation and is limited. Tickets may be purchased by calling The Cliff Drysdale Tennis Center at (305) 365-4300 or contacting Mark Chellas at Mark.Chellas@ritzcarlton.com. $75 per person provides spectators tickets to view the exhibitions, sip champagne and nosh hors d’oeuvres while they watch all the action. $750 per person provides entry to a Round Robin tournament, VIP seating, gift bag and court time and participation with Drysdale, Chellas, Cahill and top ATP players to qualify for two spots, giving local players the chance of a lifetime to play out points with the leading tennis pros. $1,500 per person includes entry to a Round Robin tournament, guaranteed hitting time against and alongside the top pros, VIP seating, gift bag and group photo opportunity. $5,000 provides one VIP All Access Pass including one player entry in the Round Robin tournament, 15 minutes of guaranteed playing time against and alongside the top pros, VIP courtside seating, gift bags and individual meet-and-greet photo opportunity. Proceeds from the fourth annual All-Star Charity Tennis Event will support the Greater Miami Tennis and Education Foundation (GMTEF) that helps economically and socially challenged youth learn tennis and valuable life skills by participating in free, affordable GMTEF tennis and education programs throughout the school year, as well as during the summer. Have a little fun on the tennis courts with the pros while you make a positive impact on our community. See you there!